NEW DEVELOPMENT IN MANCHESTER continues at a hectic pace. 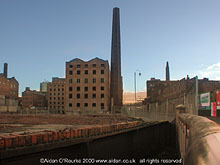 More and more luxury apartments with luxury price tags are being built all round the city centre, but particularly along the line of Whitworth St and Whitworth St West - once a deserted area of warehouses, factories and workshops, now an important ley line in Manchester's cafe bar landscape. In 2000 industrial space is being converted into living space. But is the new urban landscape going be a pleasant place to live in, particularly for families? See also the Commonwealth Games stadium under construction, and panoramic view of the buildings along Canal St. 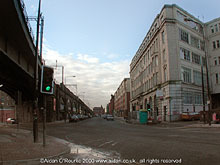 THE CORNER OF OXFORD ST and Whitworth St West is in December 2000 undergoing major redevelopment. Within a few months, a new luxury apartment block named Whitworth West will start to arise on this corner, transforming the look and character of this busy gateway into the city centre. This location will be convenient for the Cornerhouse (left) and the Palace (right) where "Oh What A Night" is currently showing, but where's the nearest park? (It's Sackville St Park, opposite UMIST main building). 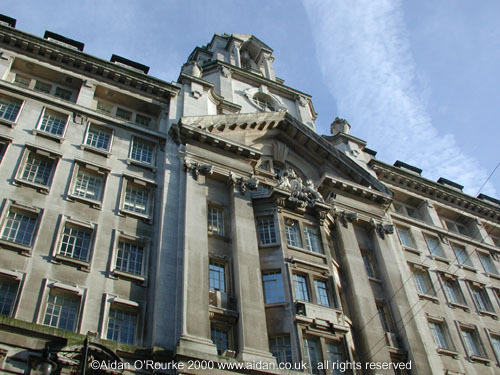 Next to the Palace theatre just up Oxford St is the gigantic facade of St James Buildings. ST JAMES' BUILDINGS are located on Oxford Street, just up from the junction with Whitworth St and Whitworth St West. They were opened in 1912, and were designed by Clegg, Fryer and Penman. Like many buildings in this district of Manchester city centre, this one is a symbol of Manchester's prosperity brought about by the opening of the Manchester Ship Canal in 1894. It's built in Portland Stone and is in the Edwardian baroque style. Eyewitness says: Why can't we have some new buildings constructed in Portland Stone, instead of the plain red brick and sandstone that all architects seem to be wedded to at the moment. THE RITZ, on Whitworth St West is one of Manchester's most famous dance halls and is fondly remembered by many who came here in previous years. It is commemorated in the film "A Taste of Honey" Dora Bryan and her shady boyfriend danced the night away to jazz music here, 1961-style. In 2000, the Ritz is still one of Manchester's foremost dance and music venues, though the style of music has moved with the times. 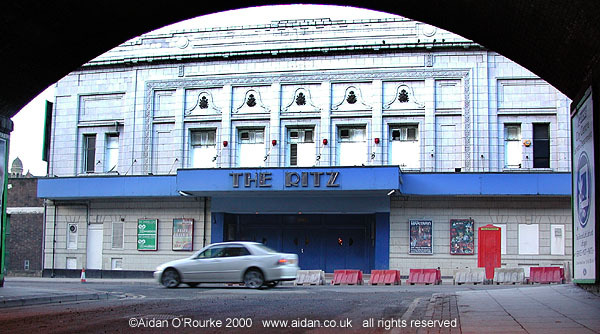 Here we see the facade of the Ritz from under the arch of the Oxford Road Station railway viaduct. WHITWORTH ST WEST is seen here looking west towards Castlefield. On the left we can see the Oxford Road to Deansgate railway viaduct. To the right is a tile-fronted warehouse building dating from the 1920's. Further along on the same side is part of the Bridgewater Bank development of luxury apartments. The new facade is scaled to fit in with the line of the street. In the distance we can just see the City Arms pub. CHORLTON MILLS, on Cambridge Street, are being transformed from half derelict remnants of the Industrial Revolution into some of the plushest and most fashionable apartments in the city. The developers have maintained the fabric of the building, including the landmark chimney. A complex of two storey workshops and smaller industrial buildings which stood to the left of the picture has been demolished to make way presumably for another residential development. Under the bridge, the meandering River Medlock - once the southern boundary of the township of Manchester, flows towards Castlefield, where it meets the Irwell. REMAINS OF MANCHESTER'S INDUSTRIAL PAST are ever present - here we are looking from Whitworth Street West under the Oxford Road to Deansgate railway viaduct. The arches have been opened up and made into public spaces. Parts salvaged from the former gasworks have been put on display here. The municipal gasworks at Gaythorn used to stand roughly where the open grass is now. To the left is the BT's Grand Island building, former home of the British Council. To the right is the glass exterior of the No 1 City Road office building. This scene will change as another new building is soon to be constructed here. THE ROTUNDA, Whitworth Street was until 1997 the location of the world famous Hacienda night club. In that year the club was finally closed by the police because of drugs and other problems. In 2000, the building is being gutted and turned into luxury apartments. Eyewitness in Manchester has had his eye on the top floor apartment for some time, though he'll probably need a third to a half a million pounds to buy it. Eyewitness says: I wouldn't pay that much for a flat even if I had the money. 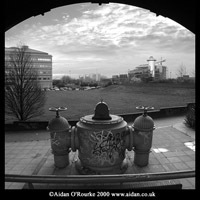 In the foreground we can see one of the salvaged parts taken from the former municipal gasworks. Our viewpoint is underneath the Oxford Road to Deansgate railway viaduct. 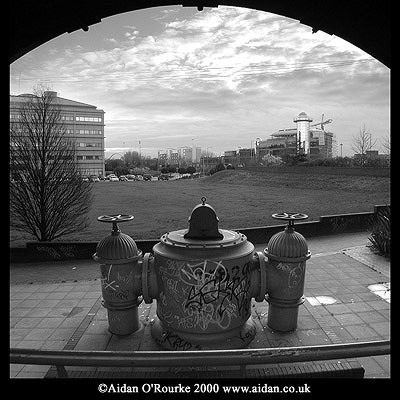 As elsewhere, relics of Manchester's industrial past are ever-present. Factory Records - founders of the Hacienda - were inspired by Manchester's industrial character. Now they too have become relics of the past - another layer in Manchester's complex patchwork of old, recent, fairly new, brand new and futuristic. MEDLOCK STREET is the main gateway into Manchester city centre for traffic coming from the south via Princess Road (the A5103) and the M56. Before the extension of Princess Road into the city in the 1950's, this was a grimy side street lined with old factories and warehouses. In late 2000 it is being redeveloped post-millennium style, though even with all these new structures, Eyewitness in Manchester hardly considers this to be a fitting entrance boulevard into the city centre. 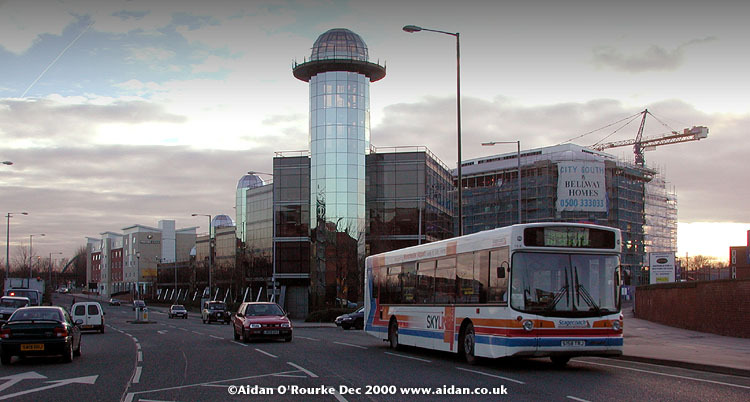 In the middle of the picture is the controversial "No1 City Road", an all glass exterior office building with its courgette-shaped glass tower. It was built during the 1990's. Two brand new buildings have appeared on either side - to the right, City South - a development of luxury apartments by Bellway Homes - and to the left, overlooking the Princess Road roundabout, a new hotel. THE COMMONWEALTH GAMES STADIUM is arising out of a sea of mud and rain puddles in the former Beswick and Bradford districts of Manchester, now known as 'Eastlands'. 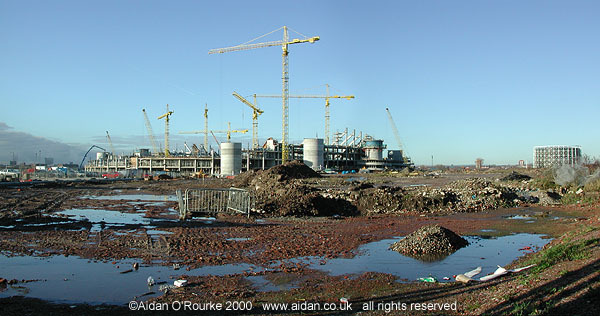 Here we see the site in mid-December 2000. This state-of-the-art sports venue will be the focal point of the Commonwealth Games, due to take place in Manchester in July 2002. After the Games, Manchester City football club will be moving in. On the far right can be seen the Philips Park gasholder, a remnant of this area's industrial base which was virtually wiped out in the post-war years. 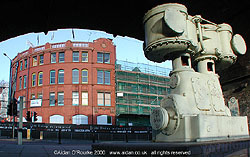 CANAL STREET is the main artery of Manchester's much-publicised Gay Village. From the early 80's this formerly deserted warehouse district has undergone a gradual evolution into one of the busiest and trendiest places in the city, day or night. This transformation is similar to what happened along a similarly named street in New York. Here we are looking at Canal Street across the canal from the car park, once the site of a warehouse. On the left is the New Union Pub. Along Canal Street you'll find a succession of trendy restaurants and cafe bars, many catering to a mixed clientele, others exclusively gay. Rising high above the scene in the centre of the picture is Portland Tower, formerly St Andrews House, built in 1962 and refurbished by new owners Bruntwood during the 1990's.